Many social enterprises tackle societal problems or demands. Your audience wants to know how prevalent this problem is and why your company decided to take on solving this issue. At the beginning of the pitch, you need to make it clear what the problem is, who is impacted by this problem, and why this problem is worthy for people to spend money and time into solving. Laying out a clear societal issue would make your pitch more effective as you are showing a dire need for your product or service. Ultimately, social enterprises have to be viable businesses in order to succeed. Your audience wants to know if there is a sizable market potential for your product or service to see how much your social business could impact. By showing the market size potential and market share your company can potentially hold, you can show how effective your social business could potentially be and how many lives your product or service could revolutionise. Social enterprises aim to fill a much needed demand within society. This is probably one of the most important part of your pitch as you will essentially be explaining your business’s role. You have to explain why your product or service will solve the societal problem and how it would help fill the needed gap. Investors want to see a feasible business model that clearly outlines how your solution can successfully help the target audience. Not only do you have to explain why your product or service will be effective in solving the societal issue you decided to focus on, but you need to also go in depth into how and why your team specifically can address this need. Investors want to know why your team’s experiences and achievements would specifically make your company a better fit for solving the societal problem than other competitors. Your audience wants to be involved in successful social enterprises. By showing how much traction your business have gained in the past, you can emphasise your social enterprise’s results and achievements to show how your company is succeeding. These past results also foreshadows how well the business could potentially do in the future, attracting people who want to work with and invest in companies that will succeed. A growth plan is critical to show your audience the direction your social enterprise is intending to head towards. Before becoming involved with your business, people want to know if their beliefs and goals are compatible with your company’s and a growth plan is a perfect way to map out your goals, often by using a timeline. Through a growth plan, not only are companies making it clear where they see themselves in the future and able to judge themselves in a practical manner, but it also shows the investors you’re serious about taking it to the next level. The whole point of the pitch is to ask the audience for something and this is the time to ask for it! You should be direct and clear in asking for what you want to avoid any misunderstandings or confusions that might arise later on. 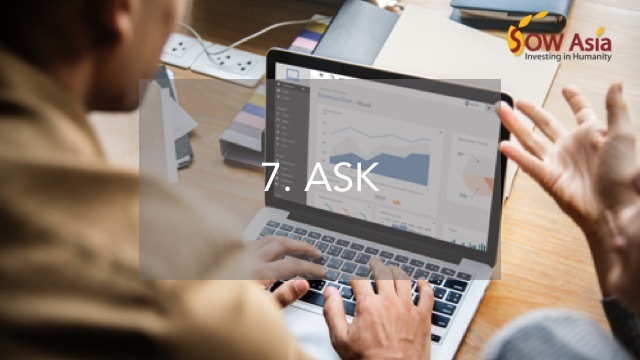 In addition to the ask, make sure you include the expected return and how your company plans to use the funding to justify your ask in a reasonable manner. Audiences tend to react positively if the ask lines up with the business model and growth plan as they will be able to tell your company is taking your business aims seriously. Most people would want to know the team behind the business idea before becoming involved so it would be a good idea to include an introduction of the core members of the team. This allows people to familiarise themselves with the team and develop a more personal connection with the company. By providing more information on the team members, investors can evaluate their compatibility with your team and see if they’re a good fit to potentially invest in your business. At the end of the pitch, you would want to reiterate everything to remind the audience of the key points of your pitch, including the ask and what makes your social business unique. This refreshes your audience’s memory and hammers the important points into their mind so they won’t forget any crucial details.